We have all heard of the common grains like wheat, rye, barley, rice, and corn (yes, corn is a grain, not a vegetable!). Maybe it is just because we all have a hard time pronouncing it, but ‘Quinoa’ (hint: keen-wah) is one grain that has taken the back seat to more commercially grown and processed grains, at least until now. With the rise of the big gluten controversy, quinoa is gaining popularity because, in addition to being naturally nutrient dense, it is also a naturally gluten-free grain. Whether you have a gluten intolerance or are just looking to pack as many nutrients into one sitting as possible, you should be taking notice of what the ancient Incas referred to as the “Super Grain of the Future”. We have all undoubtedly heard the claims surrounding gluten, the protein binding agent found in most varieties of wheat, rye, and barley. The majority of the population can digest gluten without noticeable issues. For others, gluten can cause negative effects on the digestive track and trigger the immune system, causing bloating, diarrhea, constipation, rashes, headaches, fatigue, and more. This has led many people to seek out alternatives to gluten-filled breads, cereals, pastas, sauces and dressings ushering in the era of the quinoa revolution! Aside from giving people with gluten intolerance a versatile option, quinoa is packed with many essential amino acids, vitamins and minerals, giving the rest of us a reason to take notice! Let’s start with the fact that quinoa is a whole grain, meaning the grain seed (which contains most of the nutrients) remains intact after harvesting and milling, unlike other processed grains. Because quinoa retains its grain seed, it is loaded with almost double the fiber than most other grains, which helps to promote and regulate a healthy digestive system. Fiber rich foods tend to be lower in calories, yet they keep you fuller for longer periods because they take longer to chew and digest. Fiber is also known to lower high blood pressure, cholesterol, and glucose levels. Still not convinced quinoa is one of the best foods you can feed your body? Keep reading! One of the facts quinoa can boast about is that it contains all nine essential amino acids. Amino acids are the building blocks to protein, and we need protein to help support basically every function in our bodies. Essential amino acids are special because, unlike the other 11 amino acids that we use to make protein in our bodies, the nine that are contained in quinoa need to be consumed from an outside source because our bodies cannot produce them on their own. One of those essential amino acids is ‘lysine’ which is vital for tissue growth and repair. If for no other reason at all, essential amino acids are some of the best reasons to enjoy quinoa! 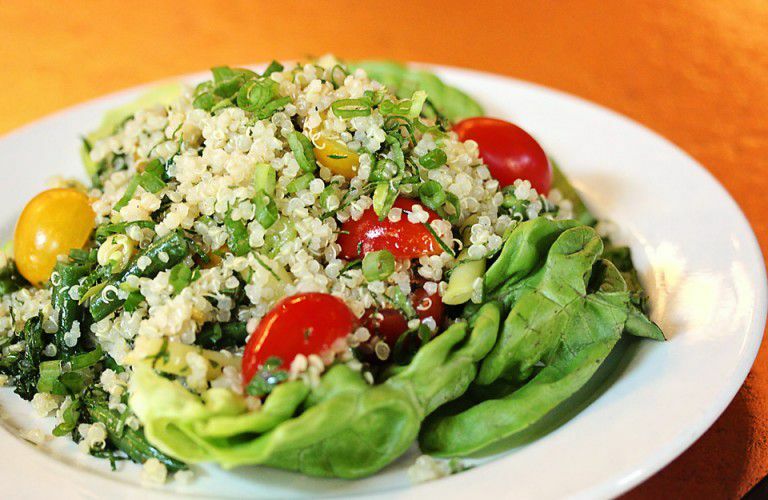 Quinoa is also loaded with iron, which helps maintain healthy red blood cells and hemoglobin. Iron is also responsible for carrying and supplying oxygen to our cells and muscles. Iron deficiency is the most common and widespread nutritional disorder in the world affecting over 30% of the world’s population. Another important mineral found in quinoa is magnesium. Magnesium’s benefits include relaxing the blood vessels (which can help alleviate headaches), regulate blood sugar, detoxification, and promotes healthy bones and teeth. Quinoa also maintains high levels of antioxidants, especially manganese which helps to protect cells from injury by free radicals and other toxins. Need more energy? Quinoa also contains high levels of Riboflavin (B2) which can increase energy metabolism and production within brain and muscle cells! The best part is that the increased energy comes at little calorie cost since one-fourth cup of dry quinoa contains only 160 calories. Other macronutrients include 2.5 grams of fat (0 grams saturated and trans fat), 0 grams of cholesterol and sodium, 27 grams of carbohydrate (3 grams of fiber and 0 grams of sugar), and 6 grams of protein. As if being packed with so many nutrients wasn’t enough, quinoa is so versatile and can be enjoyed as a cereal with cinnamon, sugar, and fruit; or, it can be used as an ingredient in salads or side dishes. Note that quinoa cooks like a pasta, not a rice so not all the water will be absorbed when it is fully cooked. Also make sure you rinse the quinoa thoroughly before cooking to avoid a gritty taste. 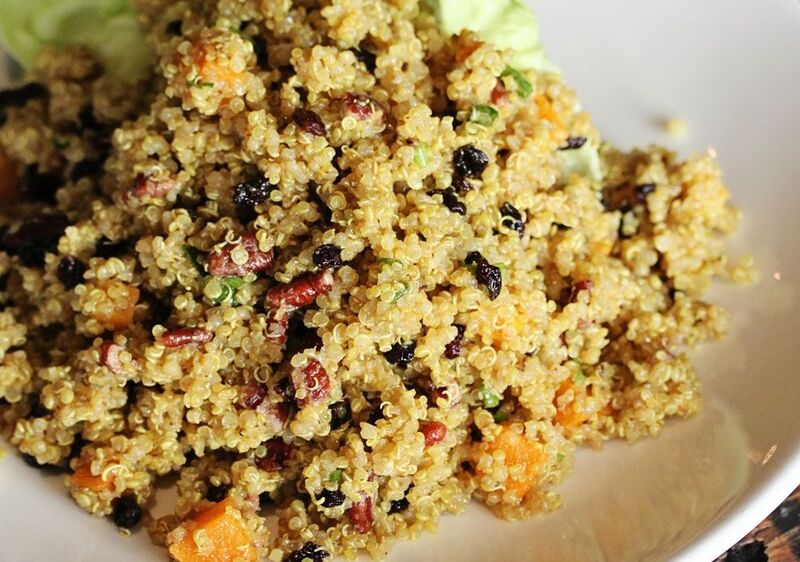 We have a couple delectable quinoa recipes that can be found in the Epicurator archives like this Early Summer Quinoa Salad and Quinoa and Roasted Butternut Squash.